Awesome, in a wrong yet funny way. Right under ‘title’ on Blake Snyder’s Beat Sheet, there’s a little box called ‘tag line’ (but should really be called ‘logline’), which, frankly, used to scare the whatsits out of me. 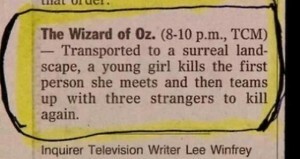 A logline is your short story, novel or epic fantasy saga, summarised in a single sentence. It’s your pitch, your calling card, the line you pull out whenever you’re asked what your book is about. Because, if you’re standing in an elevator and someone says they’ll give you a million dollars if you can tell them what your book’s about in ten seconds flat, what do you say? It had better not be ‘umm’. The other advantage of a logline, as the essence of your plot, it helps you to keep your story on track. If you create it at the start of writing your next book (but not before you have an idea of what it’s about) it can be a guideline. Whenever you find yourself going in a new direction, you can reference your logline and ask yourself ‘does this serve the core plot?’ If the answer’s no, you should probably abandon the new direction. Note: I don’t use the above method. My philosophy is, particularly in the first draft, that a story should go where it wants to go. How do you create a logline? Where do you start? Is it even possible to distill the awesomeness of your novel into one measly line? The answer to the last question is yes, and, lucky for us, there are a number of webpages that answer the first, one even provided a nifty template which I used to create a logline worksheet (below). Even luckier, once you know the basic structure of a logline, they’re pretty easy to put together. The worksheet is self explanatory, and you can use it any which way you like, but here’s how I do it (working example below). Brainstorm words and/or phrases for the Protagonist, Verb, Antagonist, Goal and Stakes dot points, until you come up with something that works. I like to underline the ones that I’m happy with, it makes the next step easier. Regarding the Verb: Stanley D. Williams, in his article (the one with the nifty template) recommends using a verb that is both visual and active, to create a more potent image in the reader’s mind. Use your selected words/phrases for the Protagonist, Verb, Antagonist, Goal and Stakes to fill in the logline template. Rearrange, edit and tweak until you have a logline that you’re happy with. I like to create multiple loglines, copying and pasting them until I get the right one. This leaves me with a record of my brainstorming, to inspire further thoughts should I feel the need to tweak things later. Don’t be afraid to rearrange the template and get creative with it, it’s just a guide to help you get started. Once you’ve created a logline or two, or even before, also read 10 Tips for Writing Loglines It’s chock full of tips to help you understand the process. Even as she struggles with her sanity, a young telepath battles genetic purists to stop a global catastrophe and save her species. Even as she doubts her sanity, a young telepath battles genetic purists to stop a global catastrophe and save her species. A young telepath, struggling with her sanity, battles genetic purists to stop a global catastrophe and save her species. Struggling with her sanity, a young telepath battles genetic purists to stop a global catastrophe and save her species. A logline and a tag line are different things. A logline is a one-sentance summary of your core plot, while a tag line is the one-liner that goes on movie posters (and on your book cover). “New Day. New Superpower.” Alex Daily: Sometimes Superhero, Ashley Keene. I am in the process of writting more story, but the loglines i’ve come up with which focus on the protagonist seem to be missing certain points of the story. However the few i’ve written which focus on the antagonists goals seem to work better. Do you feel that the focus on the villain may be wrong? I think that, if you’re going to use it as your elevator pitch, your logline should focus on the main character. However, there’s nothing to say that you can’t create loglines for all of your other characters, if that helps you work the story out. Regarding your specific quandary, are you trying to put too much information into the protagonist’s logline? The hardest bit about writing a logline is trying to distil your plot to it’s essentials. In one word, what is your protagonist trying to achieve, freedom, vengeance, money, love? I just discovered this older post of yours and I couldn’t have found it at a better time. I’m working on Twitter pitches for an upcoming pitch contest in September. You’ve nailed the process and I’m grateful for your tips and tutorial and the bonus worksheet. Many thanks!